Florida grown means just what it says. All of our plants are grown in the Tampa Bay area of West Central Florida. 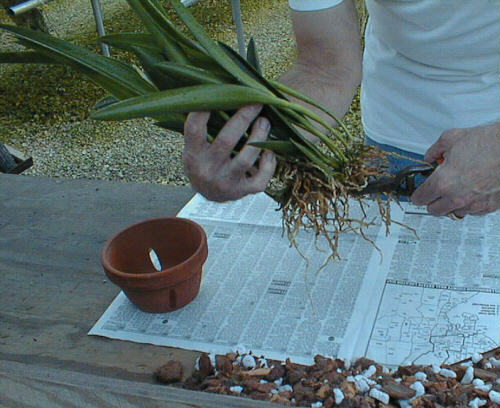 Thoroughly wet roots and then loosen from the pot using a plant tag or dull knife. 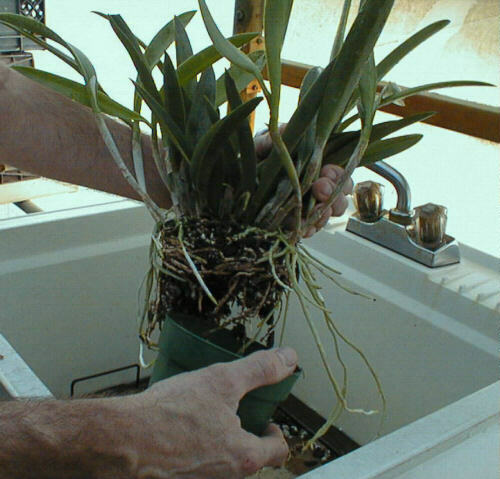 Remove plant from the pot being careful not to damage new root tips or new growths emerging from the base of the plant. Gently and carefully massage out as much old mix as possible with your fingers. With moderate water pressure hose out remaining mix, again being careful not to damage new roots, or new growth. Clean off dried sarong (leaf sheath) and rhizome area (the area that connects all of the growths), and inspect for scale insects or rot. If rot is found, cut off the bad tissue with a clean pair of clippers or disposable single edged razor blades. Then using a small paint brush dust the wound with ground cinnamon or a fungicide. Note: Always be careful when using chemicals. Read and follow the label's directions. 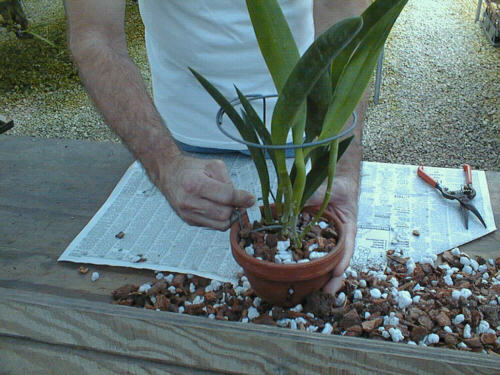 Divide the plant keeping a minimum of three pseudo bulbs per division (four is better). Always make sure that the growth left behind your cut has a new eye (growth) as it will become the new front lead on this division. 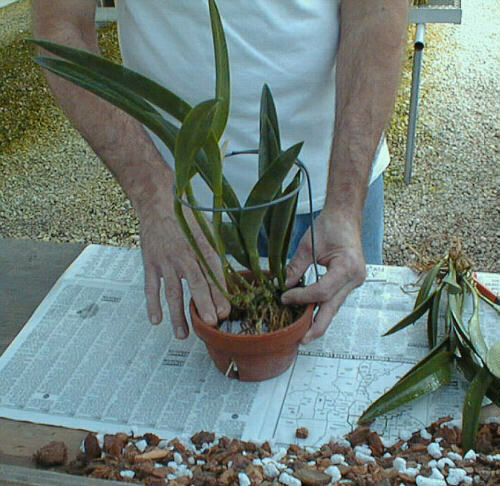 Select an orchid pot of the correct size. Plants should have enough room to put up around 2 years growth reaching the side of the pot. With most plants this should be 2 or 3 fingers. 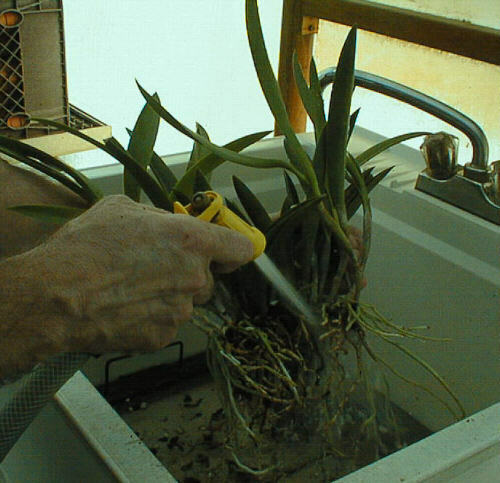 Stabilize the plant with a ring stake, rhizome clip or both. 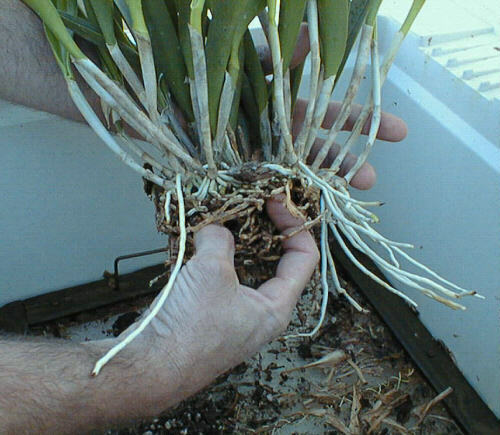 Firmly pack orchid mix around roots. 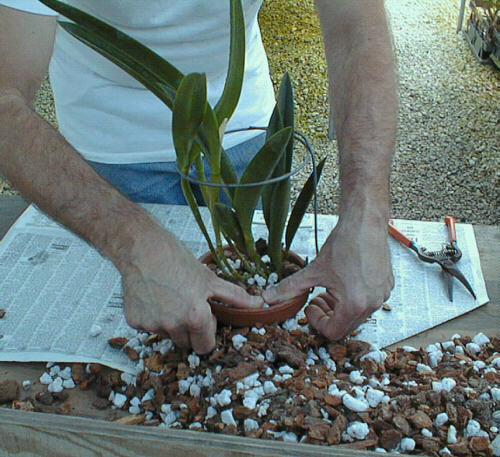 Packing peanuts or broken clay pot shards should be placed in the bottom of the pot to aid in drainage. 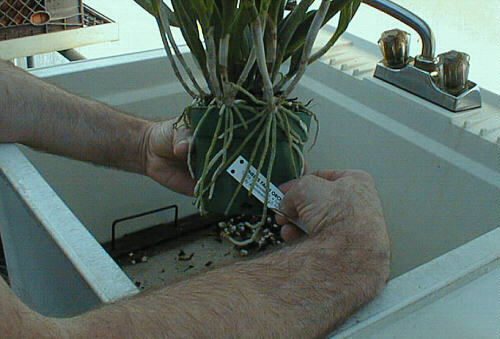 Make sure that the plant has its tag (label) kept with it at all times. This will eliminate confusion if you are working with several plants at once. It will also ensure that the plant keeps its value and can be entered into shows and judging. 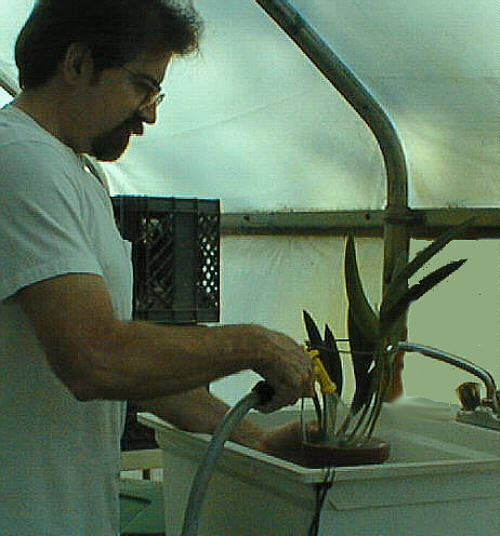 Water in your plant thoroughly to rinse out dust and to help pack the mix and provide some moisture at the roots. 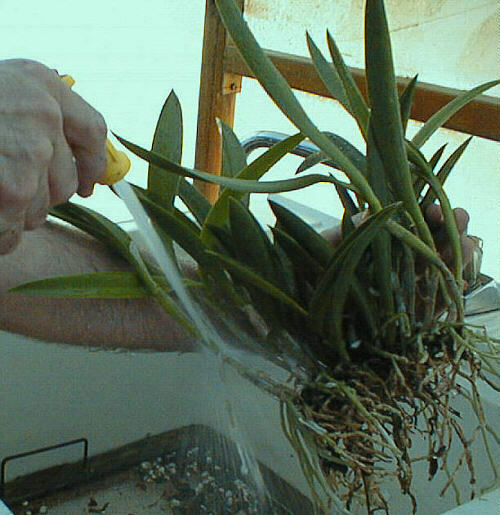 Mist the foliage often after repotting to avoid dehydration but do not heavily water the pot. Keep plants foliage dry at night. Begin normal watering in about 1-2 weeks. Always use clean tools when cutting on your plants. Never cut from one plant to another, you run the risk of passing on a viral, bacterial, or fungal infection. We use a propane torch to clean our tools. 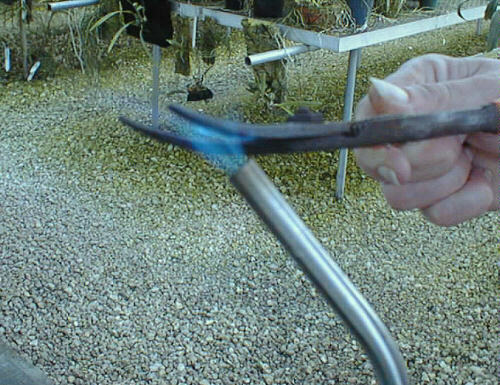 Heating the tool, you will see the moisture evaporate and then the metal will darken slightly ahead of the torch. At this point the tool should be sterile. Allow them to cool and then use or place them in an area separate from other dirty tools.